Tau-tau are statues of people who died. A couple of days before the funeral of Andan's mother. 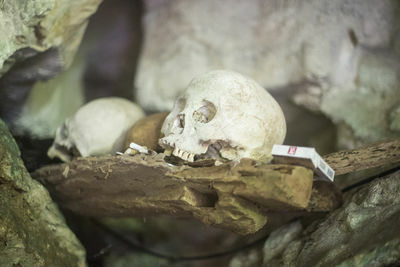 Londa (6km south of Rantepao) is an extensive burial cave at the base of a massive cliff face. 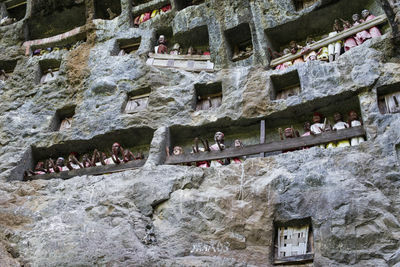 The entrance to the cave is guarded by a balcony of 'tau tau'. 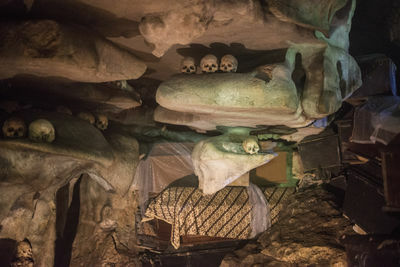 Inside the cave is a collection of coffins, many of them rotted away, with the bones either scattered or heaped in piles. Feeding the buffalo a couple of months before the funeral for a mother and son in Pangala. 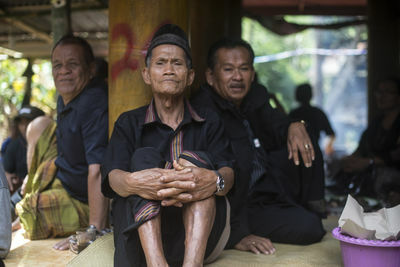 A father prepairs everything for the funeral of his wife and son that will be celebrated in July 6th. The mom passed away 8 moths ago and the son 2 months ago. He and his mother will be buried on July, 6th in his town Pangala. He died two months ago. His mother 8 years ago. Their bodies will be in the house until the funeral. 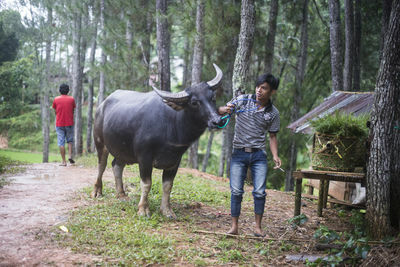 Albino buffalos are the most prized in Toraja. 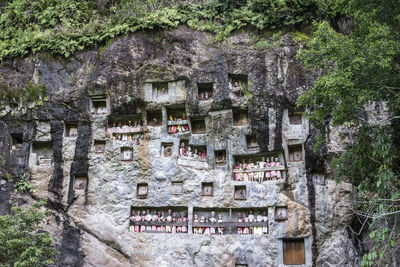 Kete Kesu, Tana Toraja, Sulawesi, Indonesia. 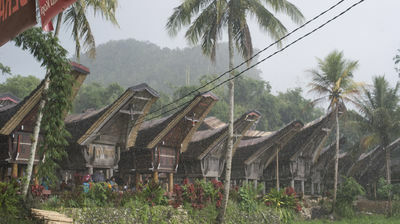 About 5km from Rantepao, it is renowned for its woodcarving and traditional tongkonan and rice barns. The roof of the houses look like boats. And all of them placed from North to South .There are several legends about it. 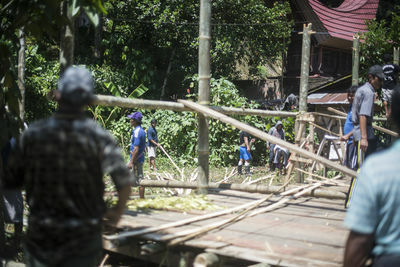 One of them says Toraja people came from the North by boat. 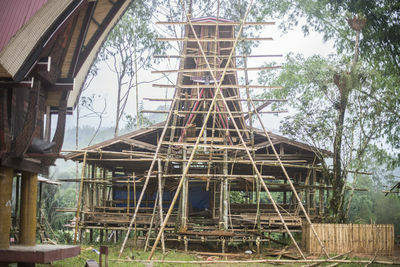 Funeral in Pangi, close to Rantepao. Attending the funeral in Pangi for Petrus who died at 84 years old. 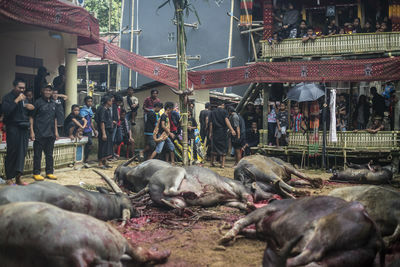 Killing 9 buffalos durinf a Toraja funeral for Petrus who died at 84 years old. 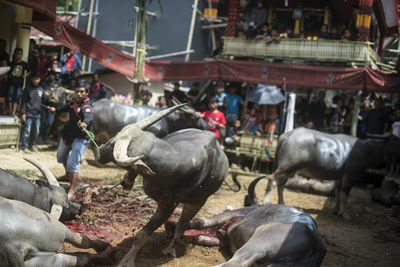 Killing 9 buffalos during the funeral for Petrus who died at 84 years old. 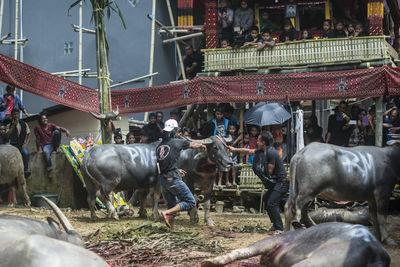 Killing 9 buffalos durinf the funeral for Petrus who died at 84 years old. 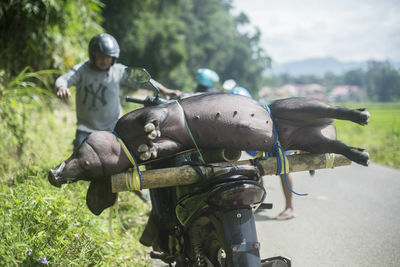 A motorbike with a pork that will be kill during a funeral close go Rantepao, Sulawesi. 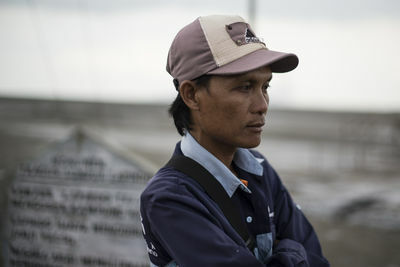 Imam, 31, is the father of a 2 year old daughter, a victim of Sidoarjo Mud Flow, East Java. 10 years ago when it happened he was in the market. He lost his house. 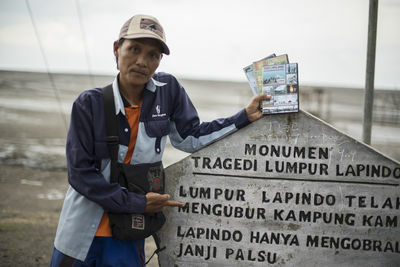 Artist Dadang Christanto made these statues in Sidoarjo to remember the victims. For 10 years the mud flow has not stopped and now the statues are almost hidden. 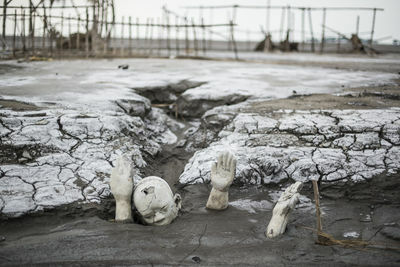 Imam, a victim of the Mud Flow. On April 25, 2015, Nepal suffered a magnitude 7.8 earthquake killing over 8,000 people and injuring thousands more. 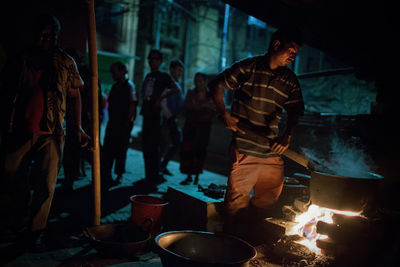 A Nepali man cooks food for dozens of displaced residents in Bhaktapur, Nepal on May 5, 2015. On April 25, 2015, Nepal suffered a magnitude 7.8 earthquake killing over 7,000 people and injuring thousands more. 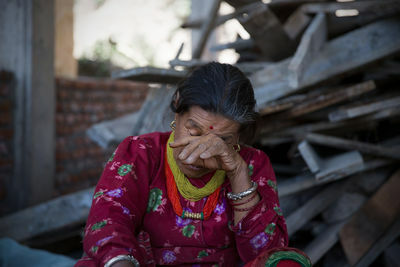 Dani Tamung, 75, cries as she describes the loss of her home and possessions due to the earthquake in Bansbari, Nepal on May 3, 2015. On April 25, 2015, Nepal suffered a magnitude 7.8 earthquake killing over 6,000 people and injuring thousands more. 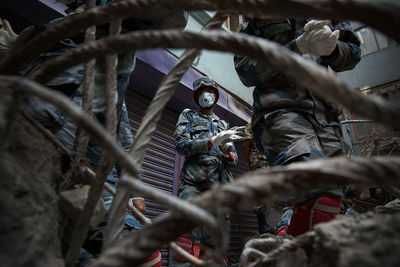 Nepali rescue workers discuss safety concerns as they prepare to remove a body from the wreckage of a building in Kathmandu, Nepal on May 1, 2015. On April 25, 2015, Nepal suffered a magnitude 7.8 earthquake killing over 5,000 people and injuring thousands more. 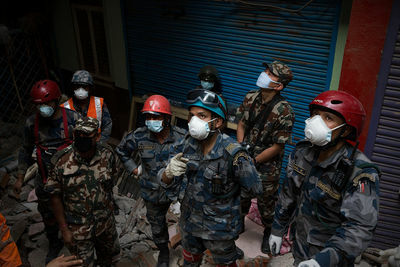 Nepali rescue workers put gloves on after they find a body in the rubble of a collapsed building in Kathmandu, Nepal on May 1, 2015. On April 25, 2015, Nepal suffered a magnitude 7.8 earthquake killing over 5,000 people and injuring thousands more. 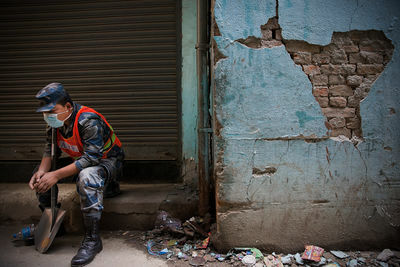 A tired Nepali soldier takes a break from rescue efforts in Kathmandu, Nepal on May 1, 2015. On April 25, 2015, Nepal suffered a magnitude 7.8 earthquake killing over 5,000 people and injuring thousands more. 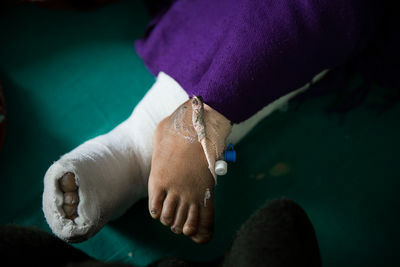 A young woman with a head injury is spoon fed at a hospital in Kathmandu, Nepal on May 1, 2015. On April 25, 2015, Nepal suffered a magnitude 7.8 earthquake killing over 5,000 people and injuring thousands more. 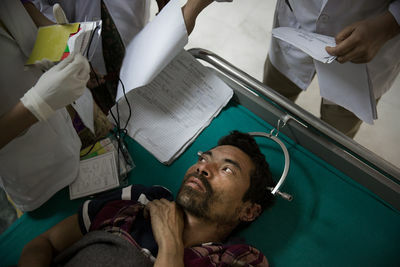 A patient has traction applied to his spinal column at a hospital in Kathmandu, Nepal on May 1, 2015. On April 25, 2015, Nepal suffered a magnitude 7.8 earthquake killing over 5,000 people and injuring thousands more. 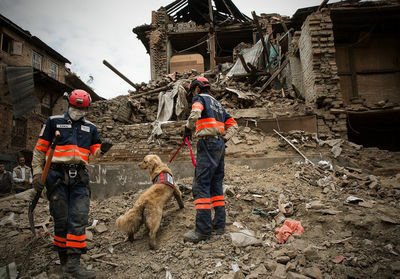 A Japanese K-9 unit searches for the body of a baby in the rubble of a collapsed home in Bhaktapur, Nepal on April 30, 2015. On April 25, 2015, Nepal suffered a magnitude 7.8 earthquake killing over 5,000 people and injuring thousands more. 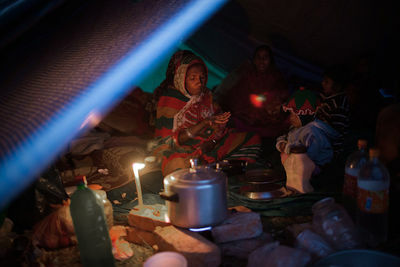 Kathmandu residents displaced by the earthquake spend time in temporary shelters in a park in Kathmandu, Nepal on April 30, 2015. On April 25, 2015, Nepal suffered a magnitude 7.8 earthquake killing over 5,000 people and injuring thousands more. 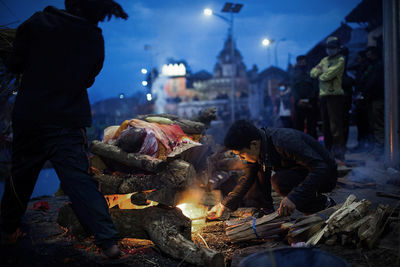 Kathmandu residents perform cremation rituals for loved ones killed in a devastating earthquake at the Pashupatinath Temple in Kathmandu, Nepal on April 29, 2015. On April 25, 2015, Nepal suffered a magnitude 7.8 earthquake killing over 5,000 people and injuring thousands more. 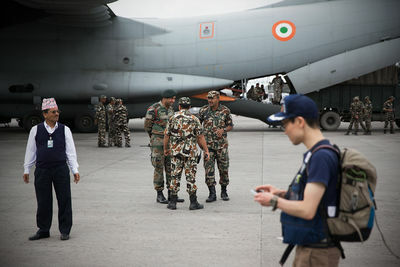 A Japanese aid worker walks past a military plane sent from India arrive at Tribhuvan International Airport in Kathmandu, Nepal on April 29, 2015. 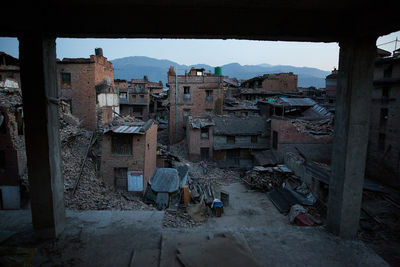 On April 25, 2015, Nepal suffered a magnitude 7.8 earthquake killing over 5,000 people and injuring thousands more. A large funeral procession took place in Baghdad for Zaid Jasim, a commander of the Nujaba Movement Shiite militia, who was killed in clashes with ISIS in Tikrit. 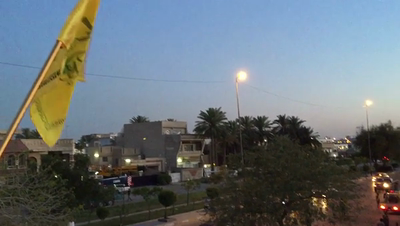 Video shows Zaid Jasim's coffin being carried on the back of a car at the front of the procession and crowds of mourners and many vehicles stopping the traffic on a busy road, playing military-style music and flying yellow Nujaba Movement flags. The Nubaja Movement is one of the Shiite militias who make up al-Hashid al-Shaabi (Popular Mobilization) and are fighting against ISIS in the western and northern Iraqi provinces. Video of clashes and aftermath of shelling in the southern Yemeni city of Mualla near Aden. The body of Ashley Johnson, an Australian fighter in the Kurdish People Protection Units (YPG), was taken from Syria to Turkey at the Derik border crossing. Johnson, who joined the YPG six months ago, was killed on 25 February when the Kurdish militia retook the strategic town of Tal Hamis in northeast Syria from ISIS. 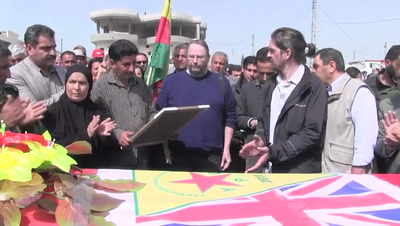 This video shows the procession in which Johnson’s body was taken from Syria to Turkey. It also shows the body of former British Royal Marine and Peshmerga fighter, Konstandinos Erik Scurfield, who died on March 4, being taken from a hospital in the Kurdish city of Derik to Iraqi Kurdistan through the Simalka border crossing. 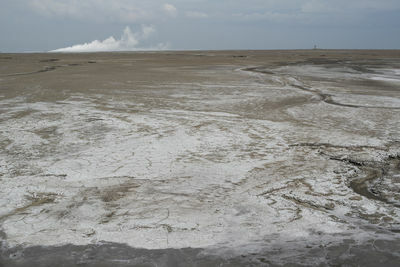 Scurfiled was also killed in the battle to retake Tal Hamis. 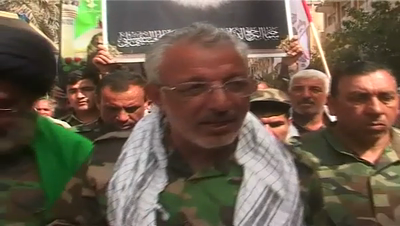 Thousands of Iraqi Shiites attended the funeral of Saad Tamimi, the military commander of the Badr Organization in Tikrit who was killed in battle on Wednesday 11 March. The Badr Organization is arguably the most powerful of the Shiite militias who make up the Hashid Shaabi or "Popular Mobilization" umbrella group of militias. Also in attendance was the Badr military leader in Karbala, Major General Hamed Saheb, also known as Abu Mustapha al-Karbalai'. General Saheb accused Saudi Arabia, Qatar and Turkey of working to help the United States, referred to as "the devil", carry out its agenda in Iraq. 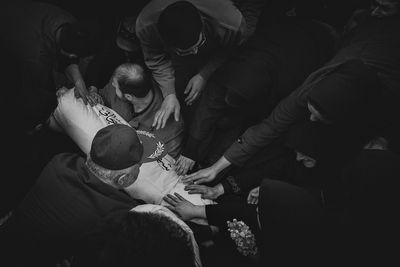 The mourners carried the coffin of Tamimi to holy Shiite shrines in Karbala while chanting Shiite slogans. Analysts and U.S. officials have repeatedly stated their concerns about the sectarianism that is (re)emerging in Iraq. Defense Secretary Ash Carter said he is "very concerned" about reports that Iran and Shiite militias are leading the fight against Islamic State militants in Iraq and exacerbating sectarian strife in that nation. 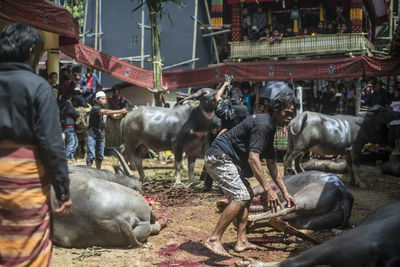 In a speech to Congress on 3 March, Carter said: "Sectarianism is what brought us to the point where we are, and so I do look at it with concern. We are watching it very closely." “I offer condolences to myself, my brothers the mujahideen, and the people of Karbala on the occasion of the martyrdom of this hero from the military wing of Badr Organization. He participated in several operations. Eight days prior to his death, he took part with me in a very difficult operation, during which he marched ahead of my mujahideen brethren, calling: “Martyrdom! Martyrdom!” The day before yesterday, he was martyred in the Salahuddin district while he tried to sweep the area after it was liberated from the criminal gangs, which had entered the land of Imam Hussein, the Commander of the Believers. I congratulate you as well as ourselves for offering an elite of [martyrs] for the sake of the Master of Martyrs [Imam] Abi Abdullah al-Hussein, in defense of the land of Iraq and the holy shrines. We say, from the city of Imam Hussein, that neither ISIS, nor the malicious House of Saud, foundling Qatar, or damned Turkey will be able to achieve this scheme in Iraq, the scheme of America, the Great Satan. This is thanks to this safety valve [POINTING TO PORTRAIT OF AYATOLLAH SISTANI] who issued such a great fatwa, and these men who obeyed the fatwa. God willing, in the next few hours, the good news of the full liberation of Salahuddin province will be announced. Born 16 july 1968 in Shahrestan village, near the northern Iranian city of Rasht, Mohammad Ali Hasanjani was only 18 years old when he was deployed by the Iranian Army on the frontlines of the Iran-Iraq war. Soon after he was killed and his body never recovered. 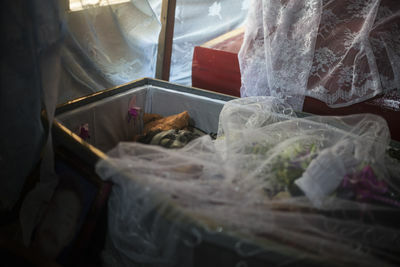 For 27 years he lay missing, buried amidst the wreckage of war, his family having no remains with which to mourn. However, after missing for 27 years, Mohammad's body was found and he was recently returned home to his village for a hero's funeral. During the Iran-Iraq war (1980-1989) hundreds of thousands of soldiers were killed on both sides. In Iran, people who were killed in the conflict were declared martyrs, or heroes for their country. Due to the chaotic and exceptionally deadly nature of the war, many soldiers went missing in battle. At the end of the war, the search began to find those missing in action and the mission continues to this day. Many of those soldiers who are found are never identified. However, in some cases, like that of Mohammad Ali Hasanjani, missing soldiers are indentified and returned home for a long overdue funeral. These photos chronicle the funeral of Mohammad Ali Hasanjani 27 years after he was killed.